I was recently privileged to acquire the Great War service medals attributed to an Acting Major of the 42nd Battalion Royal Highlanders of Canada, killed in France during the Great War. 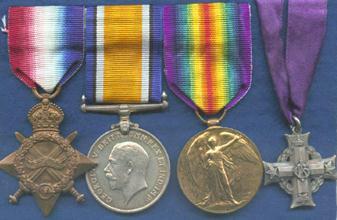 They were the 1914-15 Star, British War Medal and Victory Medal. In addition, was the Canadian Memorial Cross awarded to mothers and wives of fallen soldiers. Each medal tells a story, and the secrets that this unassuming group revealed was one that may be representative of thousands of Canadians who were killed in the Great War. The original owner was all but another name on a casualty list, until I began the task of researching the man behind the medals. This is his story. Charles Blair-Wilson was born at Clerkington, Haddington, Scotland on December 18th, 1894 - an early Christmas present for parents Ethel Maud and Dr. Charles Blair-Wilson. Young Charles entered Harris Hill private school during the summer term of 1904, at the age of 10 years. In 1907, he left to continue his education at Winchester, a well-known public school in the south of England. 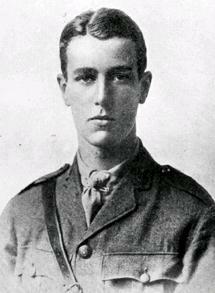 In May 1914, at the age of 19, (archival sources show that) Charles Blair left England for Canada. Sadly the reasons for his move will never be known. Charles settled somewhere in eastern Canada or Montreal, his exact location has never been determined. On the outbreak of war in August 1914, Charles having been in Canada for only two months immediately joined the 5th Royal Highlanders at Montreal, gaining a commission as a Lieutenant, probably due to his 'public school' background. The 5th RH's were partly absorbed into the newly formed 42nd Battalion Royal Highlanders of Canada, (Canadian Expeditionary Force). Lieut. Charles Blair-Wilson was posted to the 42nd as a company officer, initially attached to 'D' Coy. The 42nd embarked at the docks, aboard the S.S. Hesperian at 9am. They arrived at Plymouth England on June 19th after an uneventful voyage and encamped at St. Martin's Plain, Camp Shorncliffe becoming part of a Canadian Training Division. They practiced musketry at Hythe, and were inspected by His Majesty the King on September 2nd 1915. On October 7th 1915, the battalion began its journey to France, arriving at Boulogne the same evening, now being attached to the 7th Brigade, 3rd Canadian Division. The battalion quickly began its service in the front line, experiencing the many harrowing realities of trench warfare. In December 1915, Lieut. Blair-Wilson attended a machine gun training school, becoming for a short time, the battalion Machine Gun Officer. The 42nd saw it's first major action at Mount Sorrel (Hill 62) a few miles to the east of Ypres from June 2nd to 13th 1916. The 42nd played a critical role, along with other British & Canadian units, in saving Ypres from massive German attacks. The Battle of the Somme opened on the 1st July 1916. This was to be a disastrous day for the British (and Newfoundland) units involved, losing nearly 60,000 men on this first day alone with only minor gains of territory to show for this sacrifice. Throughout July and August 1916 a war of attrition developed where ground gained became less important than numbers of enemy troops killed - for both sides. Due to increasing British losses, more Empire troops became involved, these units being given tasks that proved to be particularly difficult. Initially, this would involve the Australians and South Africans at Pozieres and Delville Wood respectively, in July. These actions have become part of the national heritage of these countries. By September 1916, New Zealand and Canadian units, including the 42nd, had been moved to the Somme to participate in the already 3-month-old offensive. The 42nd Battalion's first action at the Somme would be part of the major offensive on the German trenches on the line Flers-Courcelette on September 15, 1916. This day would become an important day in world history and also my own family history. The day would see the first successful use of modern tanks in warfare and the death of my own uncle, serving with a British battalion as part of the same attack. The actions at Courcelette would also become part of the national heritage of New Zealand and rank alongside the capture of Vimy Ridge, in 1917, as part of Canada's proud achievements. The 42nd Battalion Royal Highlanders went over the top at 6:00pm on September 15th from their designated jumping off point of 'Sugar trench'. They moved steadily forward toward 'MacDonnell Road', following a bombardment laid down before them, which lifted shortly after Zero. Their first objective was seized with virtually no resistance. The 42nd reorganized in 'Sunken Road' and continued their advance toward 'Fabeck Graben Trench' across 600 yards of rising ground with the heavily fortified enemy position on the crest of the hill facing them. Heavy enemy fire was being brought down on the advancing Highlanders. The two leading companies entered 'Fabeck Graben Trench' to find that the garrison had been largely demoralized by the continued bombardment. The 42nd began to dig in and consolidate their new position, Capt. Blair-Wilson and men worked on nearby 'Mouquet Road', under heavy enemy artillery and machine gun fire. It was at this stage in the operation, that B Company's commander, 21-year-old Charles Blair-Wilson, was killed, gallantly overseeing and directing his men. 'Without heavy casualties' is the description given, devoid of emotion, simple and clear. Between the operations of September 15th and 17th 1916 the 42nd Battalion Royal Highland Regiment suffered: killed 73, wounded 290, missing (presumed killed or captured) 66. Total casualties, all ranks 437 i.e. practically 50% of those taking part. 'Killed In Action' is the official circumstance of death recorded on official casualty lists compiled after the battle for Capt. Blair-Wilson. Reading the letters of condolence to his parents from both fellow officers and his men, at his side when he made the supreme sacrifice, reveals further details of events, the high regard in which all held him and the genuine humanity of those taking part in that war, long ago. As a result of this recommendation, Captain Charles Blair-Wilson was 'Mentioned In Dispatches' by Sir Douglas Haig, commander-in-chief of the British Army in France, 'For gallant and distinguished service in the field' (London Gazette 4 Jan. 1917). Looking at the medals before me as I write, I realize that there is something missing. One honour that does not consist of metal and ribbon, one that can only be given having won the respect and the love of both fellow officers and men. Only further research would reveal this, and provide a fitting end to this story. As in any war, the remains of the dead at the scene of an action suffer many outcomes depending on circumstances. In quiet periods, the bodies might be brought out of the line for proper burial. During continuous actions this would be impossible. Many bodies were left exposed, later blown to pieces by subsequent shellfire; others were buried in nearby shell holes and the graves marked as best as could be achieved. Only fate would determine whether these would someday be recovered to be re-buried as 'named' graves in neatly laid out military cemeteries. By 1916, the numbers of 'missing' and 'unknown' graves was such that soldiers often purchased their own metal identity bracelets, believing that if killed, they would stand a better chance of having a 'proper' burial, someday. Following an action, the wounded would be taken from the battlefield by their comrades either under their own power or by stretcher. Given the numbers of killed and wounded of the 42nd in the action on the 15th September, it would not seem possible that such tired and wounded men would exert themselves further to bring back the dead body of one officer to a cemetery many miles behind the front line for a formal burial and thus ensure his named grave would survive for all the generations to come. And yet these men did just that, and gave him this final honour, which would be denied to many there in future actions. Today, Charles Blair-Wilson can be found at Plot 1, Row M, Grave 2, Albert Communal Cemetery Extension, Somme, France. There, amongst close to 900 of his comrades who fell in the same battle, he now rests peacefully for all eternity. Copyright © David Bluestein, June, 2002.